Source: CICH graphic created using data adapted from Gunby, J., Bissonnette, F., Librach, C., & Cowan., L. (2011). 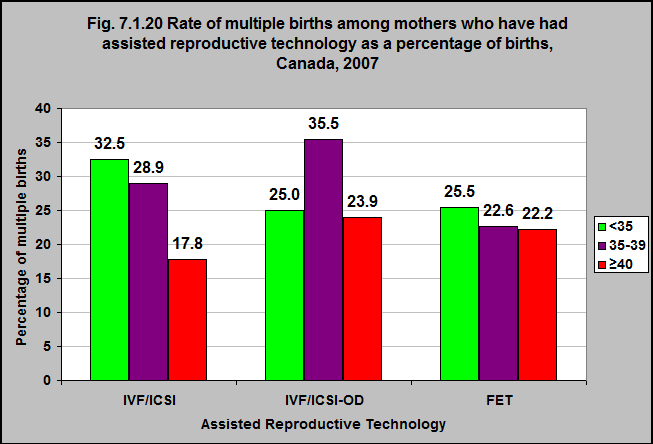 Assisted Reproductive Technologies (ART) in Canada: 2007 results from the Canadian ART Register. The rate of multiple births as a result of using assisted reproductive technology varies from 18% to 33% depending on the age of the mother and the type of reproductive technology. Among women who have had invitro fertilization with intracytoplasmic sperm injection, the rate of multiple births ranges from 18% among women who are 40 years of age or older to 33% among women less than 35.